Moss Overhaul for the Shogun 2 Total War Sengoku Jidai campaign is a mod that heavily focus on variety. Do not you feel the game lacks of options and just a few of them are worthy? Do you feel the campaign is to short?. Then you will love this mod! Sorry Shot You Map Japan Based: This gives a great base for a long campaigns. Buildings, lots of them: This new build is based on towns, this unique building for Sengoku works as the FOTS one. So castles are no longer the limit to how many free slots you have. Units, and a lot: How much units? Well I have no idea to be honest, Just check this pic to get and idea. This are not all of them! Seassons: Did not the game has this? Yeah, but now you have specific effects for them! And they are really important! Reworked AI: Well the AI is not only trying to kill you now, they build more and you can even have them as ally which is nice. Totally rebalanced economy: The new building system with a ridicullous amount of them is not just for fun, they actually give more options, all of them important. Synergies are very very important now. Also not all provinces can become a metropolis, decitions are hard, very hard. Be aware of the tax effects, food, adminsitration costs and growth!! Totally rebalanced battle stats: Oh yeah a battle!!!!! 10 minutes loading... 1 minute and it's over .. Yey???.. Well say no more, tha battle stats make battle longer, and not even that! Unit balance is less rock papper sissors. All you can carry into battle is usefull on its own way and you will have to use them!! Go full ashigaru? 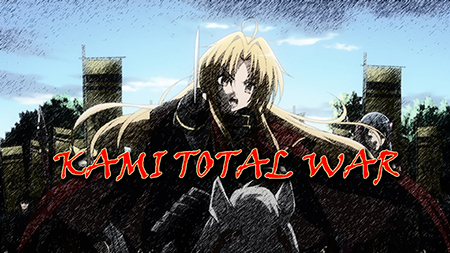 Well you will have no tactical units .. Go full samurai? You will be overrun by ashigarus!! No arty? Good luck waiting 8 turns for a siege surrender!. All is important! ALL. New unrest system: People used to become christian or ikko.. Now they also can become angry if your province goes into crime and inequality. Be aware of the taxes and buildings!! New resources: Yeah, if it was hard for you to get all of them now add some more to the list. New tech tree: New buildings, new units, this was necessary. Historical Locations!!!! One of the coolest things of this mod is the amount of historical locations this include!!! Historical Castles!!!! Did you think that they were just pictures??? No!! This include Nagashima Castle, Osaka Castle, Himeji Castle,Edo Castle and More (I made this with half of the origical size, otherwise it would use the whole battle map! Even though you need a NASA computer to run it, so a light version is also included). Why i can only build a building once? Level one of every chain can be present once clan-wide. Upgrade the building right away to make it available again. I see a resource in the diplomacy panel and in the trade routes. Yet i do not have it. Why? The game is hardcoded and I cannot change what it displays. I'm sorry for that. Uanime5: Teached me about modding campaign map and picked from expanded japan several flags. The_Yogi: Artillery and naval mod. Frodo45127: Himeji, Kyoto, Emfab and some units. Also teached me about map making. Kami: 3D models, improved saya, animations. Sorinel: Made the SOTS castles mod. Dra-San: Bugg hunter and also nightmare producer. Seriously he can find the most hidden bugg in just seconds. Also the reeskin pack. Darth Vader: Picked a few AI tables from him. To install download the files, extract them and drop them into your data folder. Pick the ones you need. The files loads without mod manager. Pick only of o these. Original only replace Hattori with Rokkaku. New Allows Imagawa, Miyoshi, Mogami and Satake. Contains all historical castles. Made by Frodo45127, Sorinel and me. Can be activated and de activated at any time. Contains the standar siege maps. Sorinel made these ones. From Strongholds of the Samurai mod. Contains the standar siege maps. Sorinel ones are better. Trigger a repetitive event starting from turn 25 that repeats and gives the player penalties. Do not activate after turn 25. All clans can recruit Nanban Units with this pack. Change the trade node skin. Pick only one or none of this files. Use this during an end turn that is repetitive crashing. It solves a really uncommong bug if untis stick. Navies cannot move using this one. -Info card for units added (this is only visible when you recruit just one unit). IMPORTANT!!!! I had to change a lot of unit inner coding. This was to an issue. I tested it and it's save game compatible. Only issue is that you and the AI will be able to re recruit some units (there are two of the same looking the same, but they are not). The old one (indicated by *) will die at some point and wont be able to be recruited. WHAT I REALLY NEED!! is you to report any bug as i mass edited this in a rush so i might have forgot somthing. -Rebalanced the prices and turns required to build and recruit. Overall it’s easier to recruit and maintain a large army while investing in buildings is more serious. The campaign develop wide faster with less early campaign hardships. -The AI now is more aggressive and will send more interesting armies to attack you. This one is a quite important update were you wont see much changes in content but should impact in gameplay. I reduced the resources required for some buildings and also improved AI. -Rebuilt regions borders. Now you get influence and trade only for true neighbours. This will make easier to understand were you get extra unrest. Also this fix issues with trade routes. -Fixed issues with naval trade. Some trade routes were wrongly placed. -FIXED AI TRADE SHIP RECRUITMENT. Now AI recruit and will use trade ships to get the nodes!! -Improvements on how the AI build. Now they should be building smarter. I'll keep working on this one. -Fixes around some buildings effects that were misplaced. -Shimazu gets a lumbercamp now! Be happy. -Bulding and tech bonuses like building cost, unit upkeep, growth, replenishment, etc are lower reaching late game. -Taxes levels other than minimal have more negative effect in happiness and unrest. But affect a bit less growth. -Conversion and happines from buildings lowered. Also some half point were added. Shogun count points when they are above half. So 1.3 means 1, 1.5 means 2, -0,75 means -1. Overall those are the changes. Nerfed building melee and armour bonuses for camps and crafters. Now castles cost money to mantain instead of giving. Improved AI. Should be more agressive, note that Ai submod block this changes. Until i recheck that one it's recommended to not use it. Major clans should have better changes tu survive now. Improved naval AI, specially trade nodes usage. A wrongly placed metsuke for Tokugawa has been eliminated. Ninja Hero should be available for Rokkaku as unique unit. -Locked leased land, if you have one delete it. -Nihon Maru and Otaka Bune up. Nihon Maru cost a lot unless you own Kyoto. 1. Effects: create a new effect called unit_cap_teppo_samurai, choose an appropriate icon and set the priority to anything above 0. 2. Effect_bonus_value_unit_record_junction: add unit_cap_teppo_samurai, set bonus_value_id to "unit_cap" and choose the teppo samurai as "unit_record_key". 3. Building_factionwide_effects: now you can use your dynamic unit cap as building effect. Note that units with synamic unit caps need an absolute unit cap of 1 in units_table. The UAI mod and DaVinci's Shogun 2 Realism+ would be a good start as they have improved the CAI. So what you want is using different building as dynamic unit cap limiter.Check my RGM mod to compare, what you seek its already done, you can also use shogun 2 realism made by Destin since he also implement dynamic unit cap in building, i know what your goal is, so if you build 3 dojo samurai lvl 1 you get 3 katana samurai, if you upgarde it to level 2 dojo you get 3 heavy samurai, so if we build 1 archer dojo,lvl 3 naginata dojo, lvl 2 samurai dojo, we can get different maximum and quality army you can field. Just for you know, since we already cut the ability of ai to spam, that mean ai will react differently since you already cut his wing, blindly use other people CAI will resulting strange behaviour for ai (since when they make it, dynamic unit cap its still not exist only artifical made by limiting it into 10 or 20 numbers, you cant blame them too, so you also need to fix its so ai will proper expand. ^ Faster than levy routing. Ah, once upon a time I planned to do something like this..but then I got lazy, just like the usual. I did made a Building Pack for FoTS though. This is Clan Internals, so how about Inter-Clan Branch, in the form of Audience Chambers or Legendary Chanoyu Tea Rooms. A Clan can only build one. It can provide Diplomacy and Daimyo Honor Bonuses. -Construction Chain: This is Sekigahara Campaign Rip-off actually; Provides Construction Time and Cost Reductions. Ah, once upon a time I planned to do something like this..but then I got lazy, just like the usual. Dont forget the more depth and harder some unit to get recruit for human, its 3x harder for Ai to recruit it, for example i set yari monk only enable by building temple + barrack, i do notice most ai dont even build barack,even they build barrack the city slot is full or even they did make temple + barrack its only 1-3 clan did manage it eventualy.Since ai is not human, ai will continue to upgrade, not waiting till they reseach certain technology, for simple is, the ai actualy dont have plan what province will be focused building, they just used from CAI building priorities,and what enable for them, while there is remedy for this, by removing all building required technology.Still if someone want the vanilla style that need technology to unlock building,then the best option is resimple the recruitment unit method,so the ai actualy can recruit it. Last edited by Junaidi83 de Bodemloze; October 08, 2014 at 04:01 AM. What's the one between Long ari Ashigaru and Katana Ashigaru? CA acquires rights to make Warhammer Fantasy games, cue fanboy and moaning over lack of realism. "Kill the Titans, block the cannon, move the boulder, lift the spoon!" I have Steam cards and other stuff! I am selling/trading them. Last edited by Weierstrass; October 26, 2014 at 06:48 PM.